Affiliate programs are big sales generating channel for E-Commerce sites across the world. These Affiliate programs by E-commerce sites have also led to hundreds and thousands of affiliate commission based businesses. Even in India, most of the comparison sites or deal aggregating sites work purely on affiliate commission basis, which in itself is quite lucrative. Before we get into comparing various Affiliate programs, here is a short explanation of what it means for people who may not be aware of it. Affiliate programs work on a simple principle – offering fixed commissions on product sales. So for example, If I am an affiliate partner of Flipkart and for any sales that happen through me, I will be paid a certain fixed percentage (or fixed amount) of the sale value. Unlike other forms of advertising, Affiliate programs work very well for e-commerce sites, because they know the exact RoI from it. If you see above graph, it is clear that Amazon, Flipkart and Tradus are most lucrative affiliate programs that are available with Indian ecommerce sites. Flipkart’s affiliate commissions were recently increased due to Amazon’s entry into India. Though, Flipkart has said that these affiliate commissions are for limited time period (till July 30th, 2013), we think that they will carry on this structure beyond that limit. 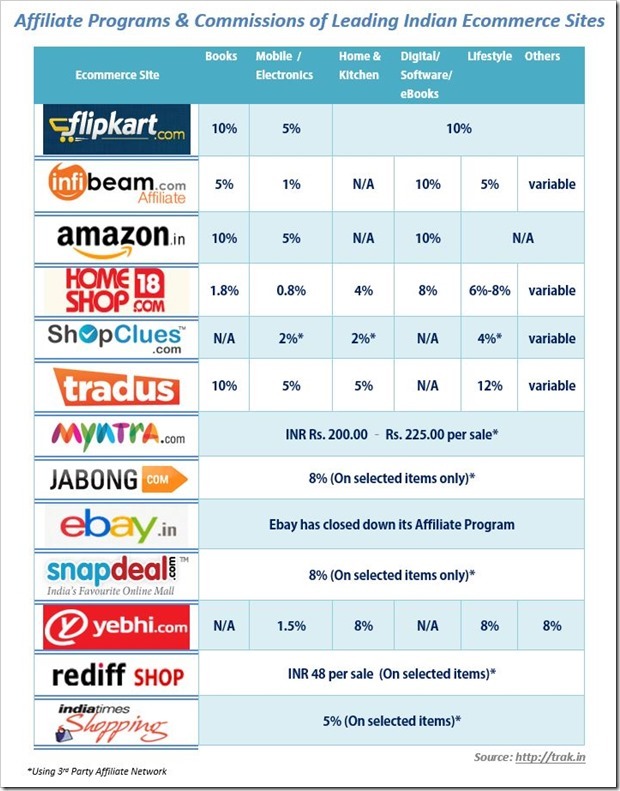 Given that others ecommerce platforms are offering similar affiliate commissions, it will be difficult for Flipkart to move back to their old structure, which had much lesser commissions. Though Myntra offers fixed amount per sale (Rs. 200 to Rs. 225), I think their structure is equally lucrative to affiliate marketers. If a buyer makes a purchase of Rs. 2000 or less, their commission actually works out to be much more than others. Please keep in mind that some e-commerce sites like Flipkart, Amazon and Tradus have their own affiliate program, while others like Snapdeal, Myntra, Rediff Shopping and Indiatimes shopping offer affiliate programs through 3rd party networks like OMG India and Tyroo. Their affiliate commissions may change slightly from time to time. Note: The above comparison chart only compares affiliate program commissions of some of the top e-commerce sites in India and by no means is a complete list. Nearly all Indian ecommerce sites have their affiliate programs, and it would be advisable to to check them individually. Which is best e-commerce affiliate network in India ? I have come across http://nsetrader.myomnistar.com/users/main.php which pays 20% on the sales. Did anyone try this? One more affiliate network firm is there who have grown very well in past one year. And they are offering a highest payout in the industry. just try for once you will feel the difference and they are following net 30 Days method for payment. Tracking is also very good till now i haven’t faced any tracking issue for sales campaign once i have faced in lead but it was also from advertiser end. after that no issue.